Blake’s is a Hair & Beauty Salon, combining traditional salon services as well as holistic therapies. Based in the heart of the suburban village of Twyford, near Winchester, we give you the same modern salon experience but in a relaxed and tranquil environment. Swedish Massage represents a general massage system developed by Swedish doctor Par Henrik Ling in the late 19th century that focuses on increasing circulation and promoting relaxation.Swedish Massge uses the hands, forearms and elbows to work the superficial muscles. It’s designed to promote relaxation, increase oxygen flow in the body, which increases vitality of skin and rid the body of toxins. Smooth stones are heated in water and then used in two different ways. Some are simply placed on specific points on the body known as Chakras. These are the energy centres in the body. Others are used to massage the body. The heat from the stones allows the therapist to work deeply into the muscle tissue faster than a standard massage. The stones placed on the Chakras re balance the body’s natural energy flow re-joining the physical body, spirit and mind as one. The treatment rejuvenates the body both physically and spiritually. There are many benefits to Hot Stone Massage. These include improved circulation, improved sleep, effective muscle relaxation, relief from muscular aches. Not least to say it is an excellent way to relax and pamper yourself or a loved one. Our therapist will be happy to talk you through the full benefits and tailor your massage to suit your needs. Deep tissue massage therapy is similar to Swedish massage, but the deeper pressure is beneficial in releasing chronic muscle tension. The focus is on the deepest layers of muscle tissue, tendons and fascia (the protective layer surrounding muscles, bones and joints).When there is chronic muscle pain or injury, there are usually adhesions (bands of rigid tissue) in muscles, tendons, and ligaments. Adhesions can block circulation and cause pain, limited movement, and inflammation.Deep tissue massage works by physically breaking down these adhesions to relieve pain and restore normal movement. 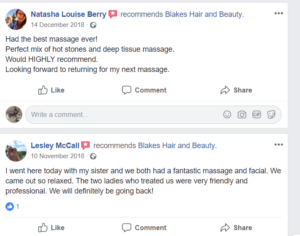 OPTIONAL EXTRAS: Express Facial (30mins) for £20| Luxury Facial (60 mins) £30 | Shellac Mani or Pedi £15 (can have both) | These are completely optional extras, if you require any of these you can simply request when calling to book with your Dreamtree voucher, and pay the extra directly to the venue on the day.